French tankers have to rely on their skill and experience to overcome certain disadvantages they face on the battlefield, lacking a heavy tank option like the M1A1 Abrams or Leopard 2. To reflect this mind-set the French Platoon rule gains them an Attack bonus if they flank enemy tanks. Making French Platoons all about manoeuvre and placement, getting the most value out of clear execution of tactics on the battlefield. When deploying, it works best if you split your tanks up into two groups, sending one down each flank to maximise your chances of flanking your opponent’s tanks. The Germans are fighting this war in their own back yard. They are fighting for their very way of life. 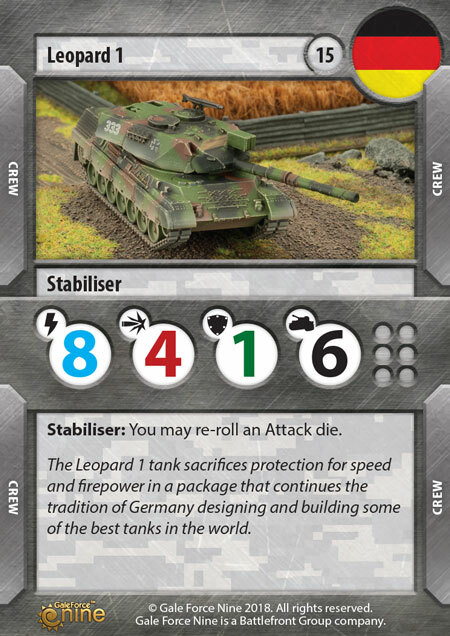 In TANKS: The Modern Age, the German models gain a re-roll to their Defence rolls when they are not near another friendly model. On top of that you get to redeploy one of your tanks after all the tanks have been deployed, this second ability is quite good and works with abilities like Spearhead. WWIII has broken out and the British have not been caught unawares. In fact they have been drilling their troops constantly preparing them for the fight to come. This defensive training is reflected in their Platoon card. Berlin Brigade gives the British models in your platoon a +1 Defence while Stationary. In TANKS: The Modern Age being stationary, to put it simply, is awesome. Yes you do give up your movement but you gain the ability to re-roll any of your attack dice. Giving up movement in a Berlin Brigade Platoon comes with a lot more bonus then drawbacks. Knowing that war was inevitable, the higher command issued the orders to launch a pre-emptive strike. To reflect this, the Soviets in TANKS: The Modern Age all about aggression. Their Red Banner Platoon card gives them +1 to their Attack if that targeting a model at close range. So you want to get in close so you can hit hard. Being on the front line at the start of WWIII, America joined this World War on day one, and will fight until its won. In TANKS: The Modern Age the Americans have diverse selections of units they can take. Their Platoon card gives them the ability to swap out a Critical Hit for two normal hits, letting every model hit harder then you may think. The Americans like to sit back and hit targets that are racing towards them, so setting up a good firing line in a forest or another well defended position will let you get the most out of your American Platoon. 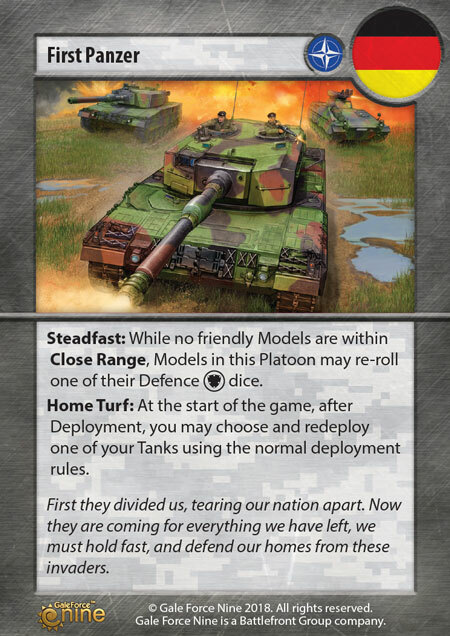 TANKS: The Modern Age puts you in command of your own tank platoon fighting in the fictional World War III. A slight twist to history, this game lets you re-enact the possible battles that could have accrued if the cold war ever went hot. You can play as British forces holding the line in Hannover to the Soviet forces invading Denmark. The war for Germany and Europe is upon us, how will you engage the enemy, will you hit them head on and match steel with steel? or will you choose to use manoeuvre and tactics to overcome superior armour? Beasts of War has been covering the upcoming release of TANKS: The Modern Age with their previews of the different factions and tanks. 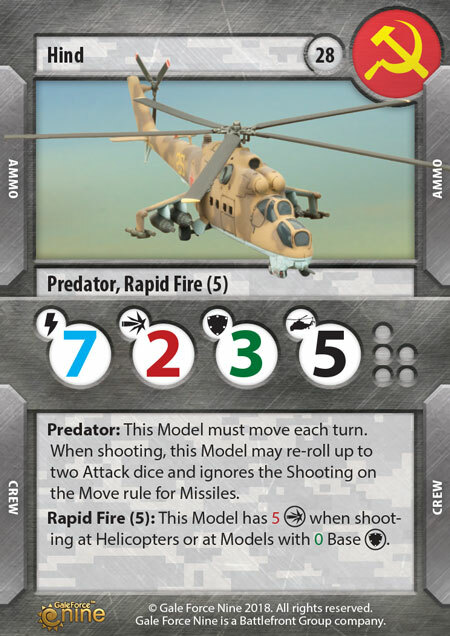 This week Beasts Of War has an exclusive Free download of the Rulebook for you to check out. And if you haven't already, make sure you take a look at their previews of the US & Soviets and the British & Germans. Click the link below and follow the instructions to grab your copy today! The Leopard 2 tank cost is a high one at 32 points, but it is worth every point. There is nothing currently in the game that has stats better than the Leopard 2. Every one of its stats is above average for the game, making it a tank to be feared on the battlefield. The Leopard 2 is the perfect tank to load up with tons of upgrades and crew cards. At 15 Points the Leopard 1 tank is amazing. Its low cost gives you the ability to run up to six of these tanks in your Platoon. With Initiative of 8, Attack of 4, Defence of 1, and Damage Capacity of 6, the Leopard 1 is well worth it for its points. It may not have Advanced Stabilisers but it has the next best thing, meaning that it is still quite effective, even when on the move. Marders are a great light weapon platform. 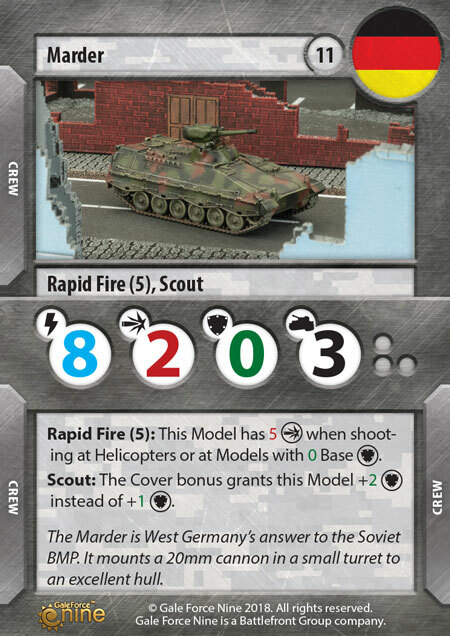 Rapid Fire (5) gives it a good Anti-Air gun built in giving it a roll in most West German Platoons, especially if you know your opponent has Hinds in their collection. 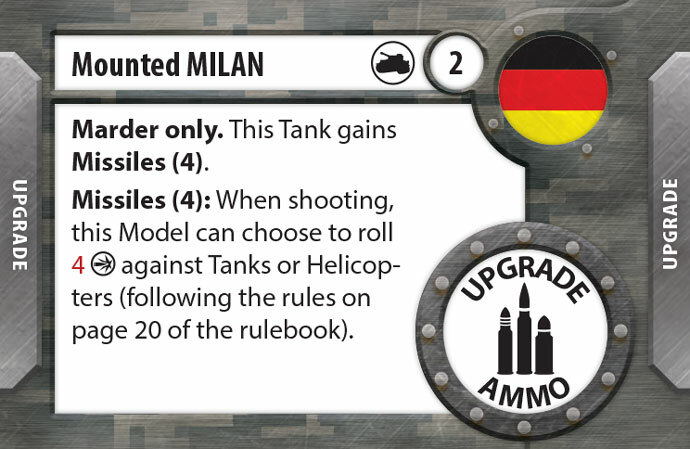 You also have the ability to mount a Milan missile to it using the Mounted Milan card. This is a interesting upgrade because it gives you a good Anti-Tank Attack when you need it and if you already have that covered in your platoon, you can choose not to add it and save yourself 2 points. On top of all that the Marder has Scout, an ability that lets it double the Defence bonus it normally would get from Cover. 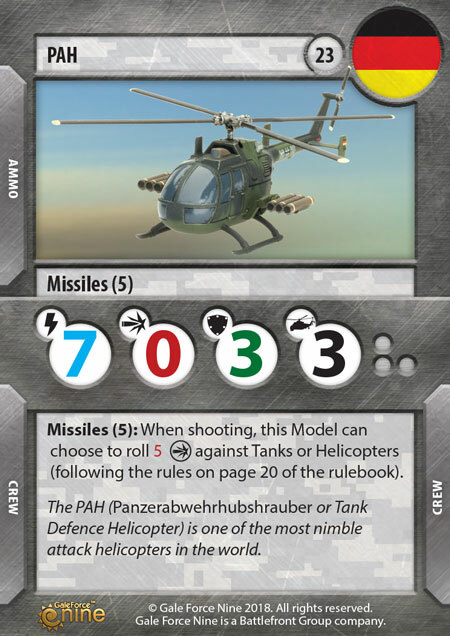 The PAH Helicopter has a great stat line, with 7 Initiative, a 5 Missile Attack and 3 Defence. Having a low Damage Capacity of 3 makes you rely heavily on those Defence dice to keep it flying. With the German Platoon rule, the PAH becomes even more dependable defensive rolls. 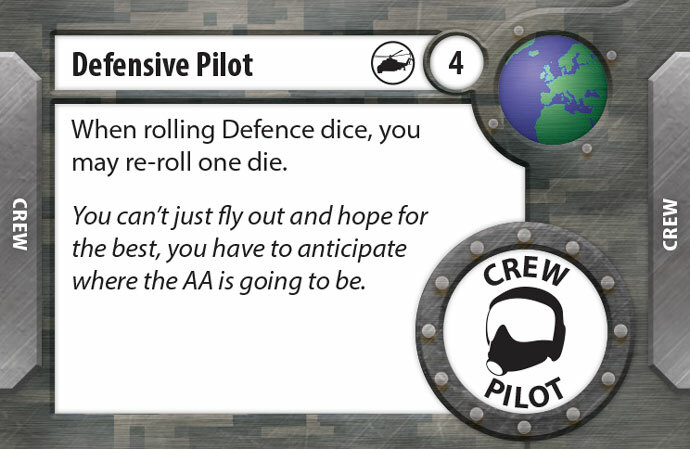 Add in a crew upgrade like Defensive Pilot, and you can be re-roll up to two of your Defence dice each time your Helicopter is Attacked. 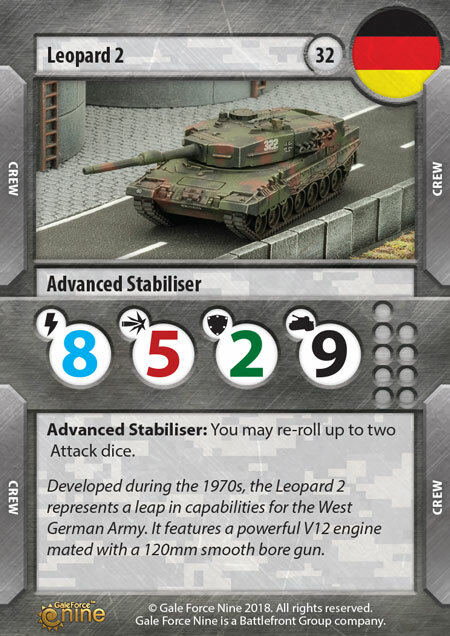 Spearhead may not be a West German only card, but it’s one that works well with West German Tanks. 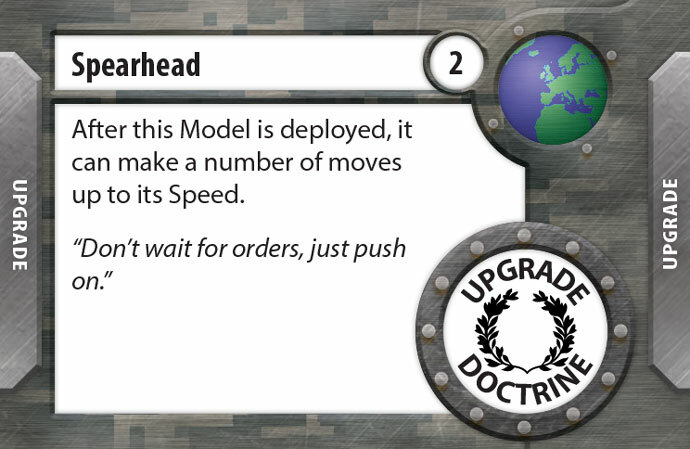 For two points this card lets your tanks move after it deploys, gaining a head start on the enemy. This ability also works well with the West German Platoon rule, Home Turf, that lets you redeploy any one West German tank. When you redeploy the tank you get to triger the Spearhead effect again. While your tank will only end up moving the same distance it moved before, it will let you fake a particular deployment plan only to change it before the game begins. Reveal is one of the new abilities crew cards can have in the game. Reveal is an ability that triggers when the card is first revealed during the game. So when you Reveal Dietrich you get to move after you shoot, giving you the ability to shoot from behind cover and move behind blocking terrain to prevent return fire. After Revealing Dietrich still gives you +2 Initiative during the Movement phase. Knowing that war was inevitable, the higher command issued the orders to launch a pre-emptive strike. To reflect this, the Soviets in TANKS: The Modern Age are all about aggression. Their Red Banner Platoon card gives them +1 to their Attack if that targeting a model at close range. So you want to get in close so you can hit hard. T-64 is one of the best Tanks the Soviet army has, coming in at 20 points you get a really solid tank with Initiative 6, Attack 5, Defence 1 and Damage Capacity 8. 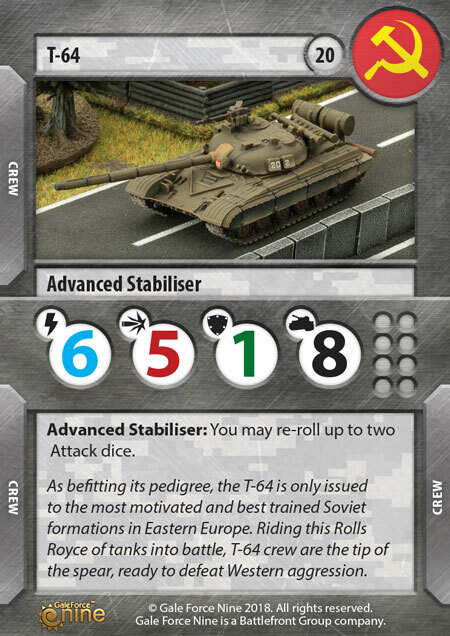 The T-64 also has Advanced Stabilisers, something that will be really useful when you are moving to get your platoon into Close Range to take advantage of your Red Banner Platoon rule. The T-55 and the T-55AM2 tanks are really nice cheap tanks to fill out your ranks. The only difference between the two is their Damage Capacity and their point costs, so choosing which one you want to add to your Platoon can be as easy as checking if you have 12 or 14 points free. 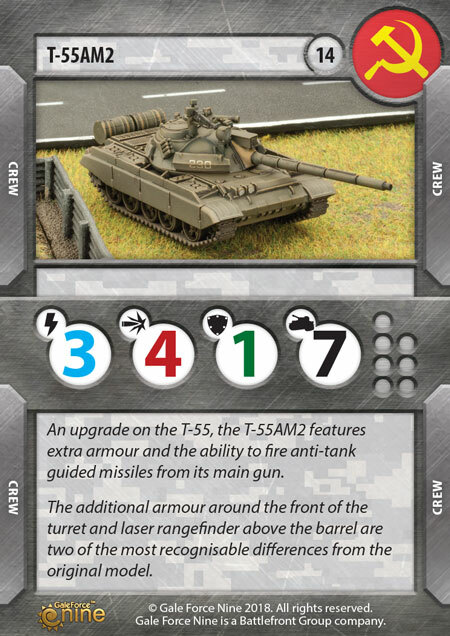 The T-55 at 12 points makes me want to go for a swarm list. You can get 8 T-55 tanks into one list and still have a couple points to add an upgrade or two. 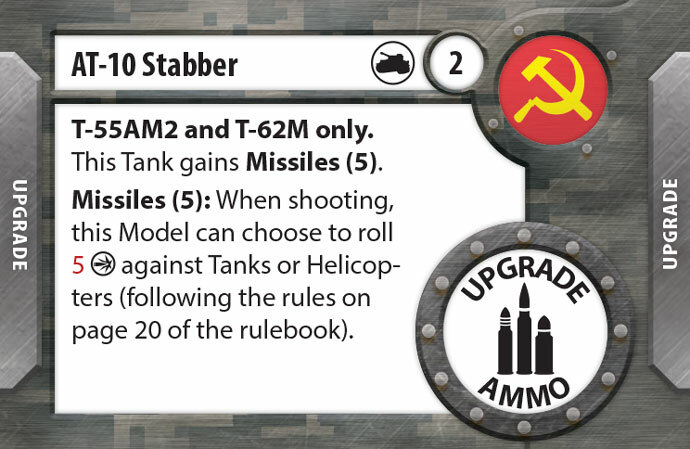 For the just 2 points, the AT-10 Stabber upgrade gives the T-55AM2 a Missile Attack of 5, making it deadly against Tanks and Helicopters alike. The Hind is a massive model, and in TANKS: The Modern Age it’s a force to be reckoned with. At 28 points you get one of the sturdiest helicopters in the game. The Hind Helicopter has a really cool feature where they can have two ammo slots. These you load up a on Rocket pods, Extra Ammo or Missiles letting you choose the load-out that best fits your Platoon. 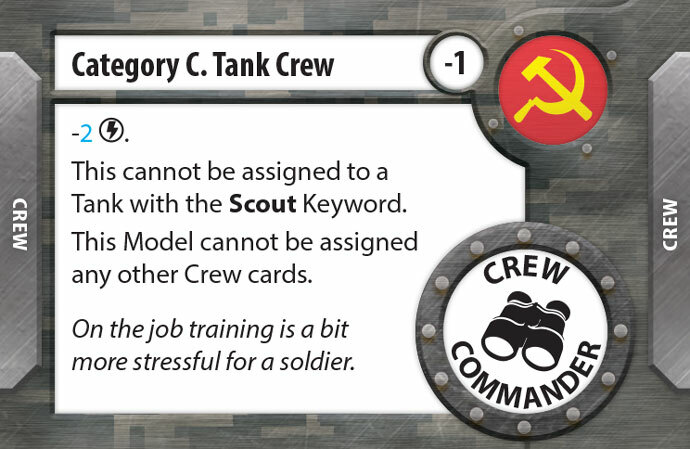 Category C. Tank Crew is an interesting card that lets you take tanks with inexperienced crew. 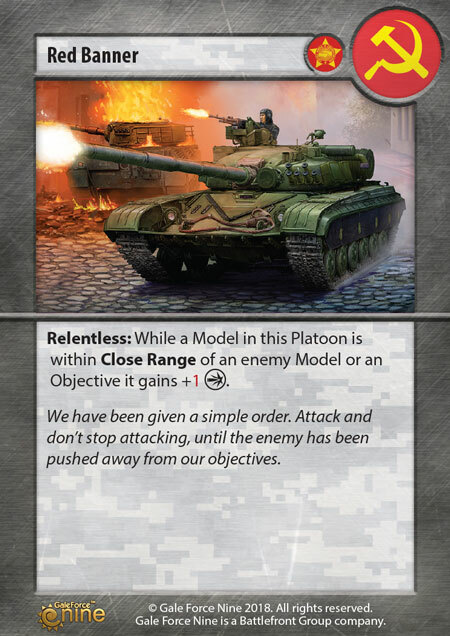 Sitting at -1 points, the Category C. Tank Crew card is one of the only cards that can reduce the cost of the tank it’s assigned to, but it does it at a cost. 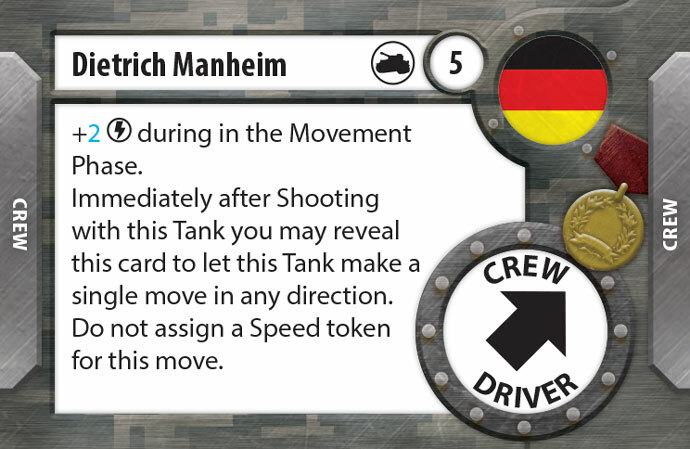 Once assigned the tank with the Category C. Tank Crew upgrade cannot add any more Crew Cards and has -2 Initiative, but with a card like this you are going for numbers of tanks over the quality of crew. 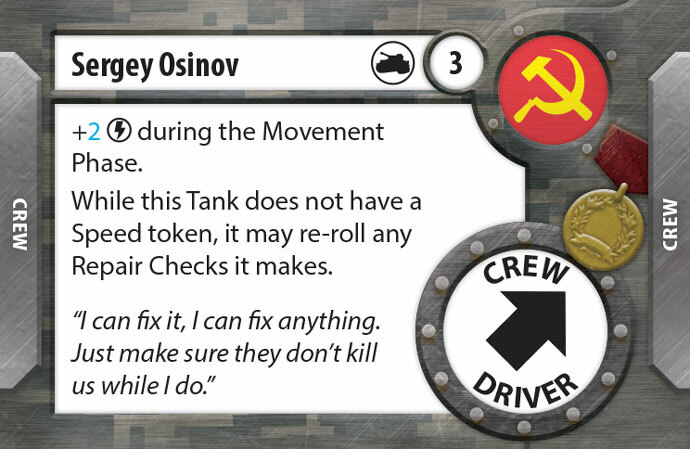 Sergey Osinov is the perfect Hero card for Soviet Platoons; he gives you extra Initiative during the Movement Step. This gives you that edge you need to make sure your tank gets within Close Range of enemy tanks. On top of that if you end up taking on damage you can give up your movement to get an extra chance to Repair lingering damage and get your tank back into the fight. 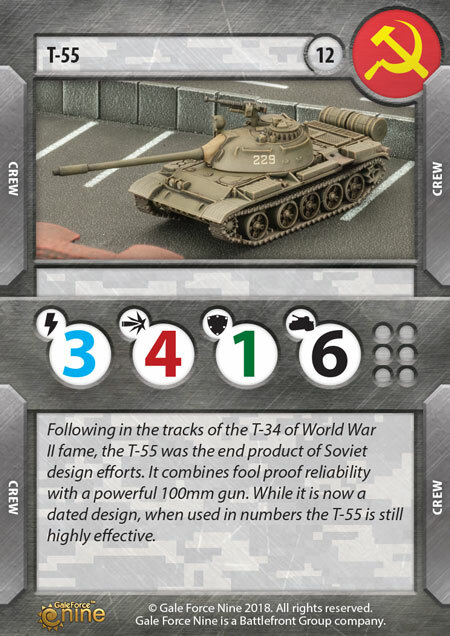 A Soviet force can be a horde of older (or lighter) tanks charging across the table top, or a smaller, more surgical force, equipped with the latest equipment and best crews. It is up to you how you want to fight World War III.